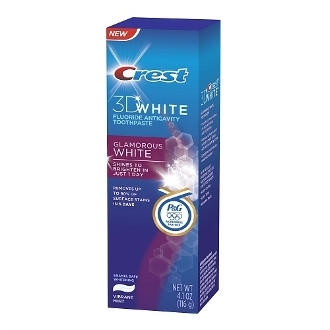 Crest 3D White Glamorous White: Whitens by removing up to 90% of surface stains in 5 days and shine to brighten in just one day for a more lustrous smile. Removes 90% of surface stains in 5 days. Shines to brighten in just 1 day. Enamel safe whitening. Anticavity toothpaste. Made in the USA Warnings -------------------------------------------------------------------------------- Keep out of reach of children under 6 years of age. If more than used for brushing is accidentally swallowed, get medical help or contact a Poison Control Center right away.